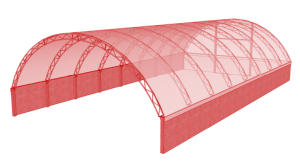 The Atlas Building Series defines the more Traditional Quonset look. The steel trusses are built with hot dipped galvanized steel and pre-engineered for site specific climate and weather conditions. The fabric cover of the building is made from specifically designed woven polyethylene, which has high light translucency, resulting in a tremendously well lit building interior. This is a key feature of Britespan fabric covered buildings, providing a pleasant and comfortable interior, which is highly regarded by both human occupants as well as livestock.